3-1 in College Football on Saturday with the 3 dogs winning outright!!! A good day in College Football on Saturday winning with BYU +6 31-14, Washington st +7 42-16 and Florida Int +5 35-21. Our loser was Arizona +9.5 23-36. In MLB we had a 1 unit play on San Fran +165 losing 2-5. I also started some Bet or Pass Setups. I used these last year in response to those of you that handicap wanting something helpful to get you steered in the right direction. Army +5.5, Ohio State -27.5, Vanderbilt +3 and Oregon St +13.5 were the setups and went 1-3. Big day in the Hilton NFL Supercontest today. Almost 1900 entrants in the contest and after week 4 I am in the top 50. 13-7 or 65%. Also, one unit plays in the NFL are off to a good start at 7-2. There was only 1 game that stood out to me and that was Houston. Every other game had negatives and essentially I had to compromise to narrow the games down to where I thought the value might be. The one game that stands out is Tenn +3.5. It’s a game where the bulk of the betting is on Tenn. Usually, that is an absolute negative but many of the other games like Detroit and the Jets had bigger negatives than going with a team that had more betting on them. It will be interesting to see how it plays out. Early in the week, I had Buffalo in the Mix but the numbers changed substantially for buffalo by Friday when I turned in the plays. It was actually my number 2 pick on Wednesday and gone Friday! My condolences if you are betting these as they are now 4-16 and 1-14 the last 3 weeks!!! 1-14 is really stretching the variance limits on games that are supposed to be a coin flip!!! I put these picks out to subscribers on Saturday at 11:00 so that they can plan their football betting for Sunday. One response I received was “What about Detroit”? This game would be on my radar. My models show Detroit has a bit of value at +3.5. In the Hilton, I could only get +3. But a variable I look at that historically has been among the strongest points to Phil. Whether the move to +3.5 outweighs it is a big ?. I will not have to think about it as I passed on the game. As far as Cleveland, yes I know Brady is back:) But my guess is the books knew that also when they put the line out at -10.5. I have often discussed with other handicappers that my technique presupposes that books come pretty close to guessing where the value is. If books started putting out lines that had no logic I would have to revamp my techniques. One other thing to note about Cleveland. They have an incredibly low % bet on them at 14%. But the line has not budged from -10.5 all week. Do the books know the right side of the game? We will see. For today I have sent out 2 one unit plays so far. “Rick, I read the email on the bottom of your site and have to say I was thinking exactly the same thing. I have followed many handicappers over the years but have never encountered anyone as consistent as you. Sure you have bad days, but year in and year out you get the money. Not only that but the education you provide is invaluable. 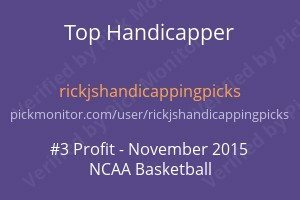 It’s a testament to your character that you would share many of your handicapping techniques with subscribers and even those that just follow your site. Finally let me also say, I miss your friendly face in the poker rooms! You were the one vegas poker player that was friendly to everyone you encountered. A real professional in everything you do. 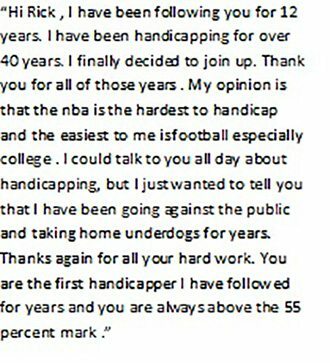 ” There are several reasons I have shared my handicapping with others. I feel it’s something I owe to fellow gamblers to guide them down this slippery slope. I often times wished I had this type of guidance when I started out as I have run into the same brick walls that other gamblers run into over the years. It is not an easy task to filter out the human element that sneaks in occasionally to sabotage you. In addition, there are selfish reasons I do this. I am programmed this way. If it were not handicapping it would be back to the poker tables or some other venture that satisfies my OCD urges. But importantly I enjoy what I am doing. Whether it has been trying jury trials, flying airplanes, playing poker or handicapping sports I always pick the most complex and difficult things to devote my mental energies too.